【TOSHIBA】TOSMICRON-CH4090FD | Products （X-ray Inspection Machine ）| MASS CO., LTD. The TOSMICRON-CH4090FD is an easy-to-use model for inspecting chip circuit boards. Incorporating Toshiba’s X-ray sensing technology, the TOSMICRON-CH4090FD is ideal for inspecting solder on chip circuit boards and provides clear images of BGAs and soldering conditions. The outstanding user interface simplifies and improves the efficiency of X-ray inspection. The TOSMICRON-CH4090FD incorporates a micro-focus sealed-tube X-ray generator with an output of 90 kV. This X-ray generator is maintenance-free and easy to handle. With a flat panel detector that provides high image rendering capability, the TOSMICRON-CH4090FD delivers clear images without distortion. The TOSMICRON-CH4090FD can capture images along the X, Y, and Z axes as well as at oblique angles. 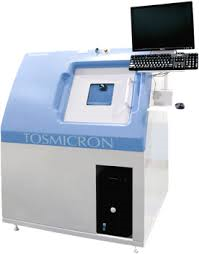 The TOSMICRON-CH4090FD has a range of features, including tracking, mapping, and BGA void measurement functions.